Imam Bayildi is a stewed eggplant dish of Politiki Kouzina (the Greek community of Constantinople), brought to Greece by the Greek refugees, after the systematic massacre and deportation of the Greeks of Asia Minor, after 1922. 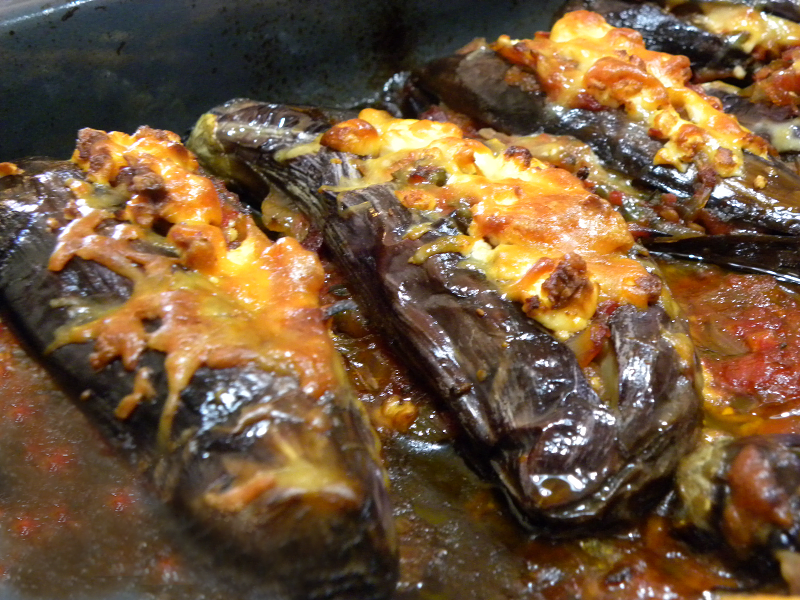 Imam Bayildi is a dish consisting of whole eggplants, fried in olive oil, until they become soft and then they are stuffed with a filling made of onions, garlic and tomatoes and baked in the oven. This dish comes under the category “ladera” which means “oily dishes”. “Ladera” food play a significant role in the Greek culture. They are considered as comfort food as they are usually, any type of vegetables, cooked vegan, with olive oil with bread to mop up the sauce and make it filling during fasting periods. They are part of the Mediterranean Diet because more vegetables are eaten this way so we get a lot of fibre in our daily intake but also valuable nutrients such as vitamins, minerals, and valuable phyto-constituents such as antioxidants. During non fasting periods they are usually accompanied by other types of food, such as dairy products, mainly cheese, meat, rice, pasta or bulgur wheat or legumes, which turn them into a well balanced meal. Their nutritional value is upgraded due to the use of olive oil, which is the main source of vitamin E, antioxidants and many other valuable nutrients, making these dishes very healthy. The eggplants are fried in olive oil, in order to become soft, before adding the filling, making them much tastier. Alternatively, if you want to cut down on the calories, you can cut the eggplants in two pieces, brush them with olive oil and fry them, basting them regularly with olive oil and turning them over until they become soft. You can also do the same and bake them in the oven until soft. However, both these two alternatives take much more time and are not authentic. Eggplants become much more tastier when they are fried. In order to reduce the calories, ater removing them from the oil place them on kitchen paper to drain for at least 15 minutes before proceeding with the recipe. There are many tales around the name “Imam Bayildi”, which literally means that the imam fainted. The name supposedly derives from a tale of a Turkish imam, who swooned with pleasure at the flavour when presented with this dish by his wife, although other more humorous accounts suggest that he fainted upon hearing the cost of the ingredients or the amount of oil used to cook the dish. Another tale says that the dish is Greek because of the “ladera” dishes of Greek Orthodox, living in Turkey. According to cookbook author Soula Bozis, author of Mikrasiatiki Kouzina (Cuisine of Asia Minor) and Politiki Kouzina (Rum Cuisine), the imam fainted after tasting his neighbour’s dish, when his Greek neighbour sent some to him as a gift! Leftovers are even better the next day but if you want to make something different, you will find a Pasta dish I made with two leftover Imam, at the end of the post, which was delicious. The eggplants I chose for this dish are called “tsakonikes” in Greek. They resemble like Japanese eggplants but they should not be long and slim but rather plump, in order to take enough filling. However, you can also use the white Eggplants of Santorini or the purple eggplants but if they are too big, you should cut them in half in order to soften before adding the filling. Modern varieties of eggplants are not bitter. However, if you know that in your country the eggplants are bitter you have to remove the bitterness. The filling is made with lots of onions, garlic and fresh tomatoes. The onion can be finely chopped or cut into slices but they should almost caramelize to get out their sweetness. I used fresh tomatoes but canned tomatoes work eqully good. The original dish is vegan, so if you want the vegan dish, just don’t add the cheese. In Greece, we love eating our “ladera” dishes accompanied with feta. However, adding feta on top or any other cheese that melt makes it delicious as it gives a little tang to the rich sauce and balances the sweetness of the onions. The first time I made this dish, years ago, I cut the eggplants into slices, I fried them, then made the sauce, which I poured on top and added halloumi on top and baked them. Wash and drain the eggplants. Remove the stem and make 3 cuts lengthwise on one side. Cut the onions with skin on into quarters. Cut off the root and remove the skin. Cut the top and then cut each quarter into slices. Heat ¾ of the olive oil in a frying pan and fry the eggplants with the cut side facing down. In 3 – 4 minutes turn them over and fry them on the other side as well. Check to see if they have become soft and if not continue frying for a few more minutes. Remove on kitchen paper, the cut side facing down in order to absorb as much olive oil as possible. Continue with the remaining eggplants. In another frying pan heat the remaining ¼ cup olive oil and sauté the onion until translucent. Add the garlic and sauté for a few seconds until fragrant. Add the sugar and mix. Lower heat and cook them, mixing every now and then, for about half an hour until they begin caramelizing. Add the tomato, 1 tbsp tomato paste, parsley, salt and pepper, increase the heat and bring to a boil. Lower heat and cook until the sauce reduces. Remove from the heat and let it cool for a while. Meanwhile grate the cheese and crumble the feta. Preheat the oven to 180oC / 350oF. Open the eggplants making place for the filling an add some of the mixture inside the eggplants through the cuts. Put the eggplants in a baking tin with cut side facing up. Add the crumbled feta and some grated graviera on top. Add the remaining 2 tbsp tomato paste between the eggplants and add the olive oil. Bake for about 45 minutes, or until golden on top. Remove from the oven and set aside to cool for at least half an hour before serving. Another time I made this dish, I had two leftover cooked eggplants, which were not enough for both of us to eat, so I cooked some penne and I turned this dish into an amazing pasta dish! Cook the pasta 2 minutes less thanr what is indicated on the box (about 11 minutes). Chop Imam into smaller pieces. Add the cooked pasta with some pasta water and cook for another two minutes. Add half of the cheese and mix.